This book was distributed at work like candy at a Halloween party. New buzz words were written on the board and everyone was trust falling one another. The problem still remains: there’s more falling than trusting. 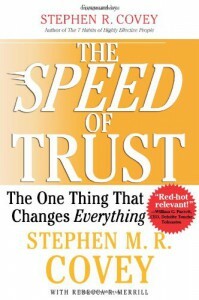 I enjoyed the first chapter and agree with the author’s sentiments: as trust improves, cost goes down and speed increases. I believe in Covey’s see, speak, behave architecture. The problem begins when Covey stretches the first chapter into over three hundred pages based on an analogy that doesn’t hold water (intentional pun). The book reads more like Chicken Soup for the Corporate Soul versus a true introspection into business practice. There are some interesting stories, but beyond that, there’s not much to offer. The book seemed more tailored to stroke the egos of Covey’s corporate partners versus giving a hardened look at trust improvement. Covey’s stories are full of fluff (back to the Chicken Soup comparison). He incorporates vague intensifiers at every opportunity: totally, apparently, extremely, really, very. “As luck would have it”, over-worn clichés are not immune. These stories are used to help us accept a weak analogy on how to build trust. Some stories were outright ludicrous. For instance, he determines the start of personal trust can be contained in such things as not hitting snooze on the alarm clock, but arising on the first ring, sleep deprived or not. I’m sorry, but this doesn’t fly with me. Maybe this is because I buy more into Mitch Albom’s The Timekeeper philosophy. I don’t believe my life is defined by an alarm clock. I was most offended in Covey’s comparisons of Gandhi and the CEOs on Wall Street. Covey tells us how transparent, honest, and trustworthy these individuals are, but I’ve been in meetings with these same individuals. I’ve been there as they plotted around new bankruptcy laws to favor the investor dollar. I’ve been there as they downsized a significant work force, only to fill those exact positions with expatriates. I’ve been there as they touted their speeches to the Indian workforce that the Chinese would be taking their place. If this is honesty and trustworthiness, then I’ve signed up for the wrong book. I’m sure this is not how Gandhi would run a business—if he would at all. If the title appeals to you, then read the first chapter. The lessons on trust apply to both business and personal life. The rest of the book is weak, contrived, and self-indulgent.